Holbeach United striker Sean Coughlan tries to dribble through the Cogenhoe defence. Photo: Steve Relf. Peterborough Sports chase their third cup final appearance of the season tonight (March 22). The city side, who are just a point away from clinching promotion from United Counties Division One, have a League Cup semi-final at mid-table Premier Division side Cogenhoe. Sports are already through to the Northants Junior Cup Final and the Hinchingbrooke Cup Final and such is the strength and quality of their squad they will start favourites to topple higher-level opposition this evening. Cogenhoe are eighth in the Premier Division and pushed fourth-placed Holbeach hard before succumbing 4-2 at Carter’s Park at the weekend (March 19). Holbeach and Wisbech meet in the second semi-final at Carter’s Park tomorrow (March 23). Deeping Rangers and Yaxley are in top-flight action tonight when travelling to Wellingborough Town and Boston Town respectively. 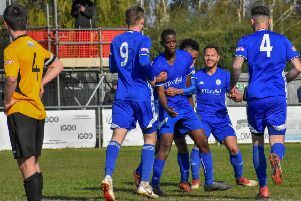 Both local clubs lost at the weekend, but Deeping boss Michael Goode saw enough in his side’s display in defeat at third-placed Newport Pagnell Town to be confident a return to form is imminent. Deeping have lost four and drawn one of their last five league games. March Town United are another team struggling for form, but they have a great chance to snap out of it when hosting bottom club Needham Market this eevening. The Hares are without a win in five league games. And Peterborough Sports Reserves also have a big game tonight when they entertain Peterborough Premier Division leaders Moulton Harrox. Unbeaten Harrox will go 11 points clear at the top if they beat third-placed Sports under the PSL floodlights. Fading Spalding United travel to Carlton for a Evo Stik Division One South fixture tomorrow. Cogenhoe United v Peterborough Sports. March Town United v Needham Market Res. Peterborough Sports Res v Moulton Harrox. Carlton Town v Spalding Utd. Holbeach United v Wisbech Town.